It was a solid, if not spectacular, night for Irish riders in Colombia. MARTYN IRVINE FINISHED sixth in the high-tempo points race on day three of the Track Cycling World Championships in Colombia last night. The scratch race silver medallist won three of the maximum sprint points and lapped the field once. The medal contenders however, lapped the field three times and after 160 laps, the gold would go to home favourite, Edwin Avila Vanegas. New Zealander Thomas Scully won silver ahead of Spain’s Eloy Teruel Rovira. 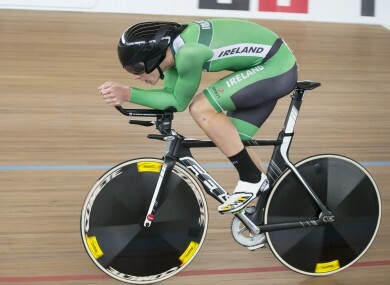 Earlier, Caroline Ryan also claimed sixth place in the world for Ireland in the individual pursuit; her time of 3.37.847 unable to dislodge World Champion Sarah Hammer or Team GB Olympic team gold medallist Joanna Rowsell. The American would go on to claim gold in a time of 3:29.711, just under a second ahead of the Briton with Australia’s Amy Cure winning the bronze medal ride-off against Ganna Sololvei of Ukraine. Tonight, Ryan is back on her bike for the points race, an event in which she claimed bronze at the 2012 Worlds. And so Cycling Ireland head coach was satisfied with Ryan’s pursuit as he looked ahead to her next challenge. “Sixth place in the Worlds is a solid result. We would have liked to get closer to a ride off, but it didn’t work out that way. Email “Sixth place for both Irvine and Ryan overnight at World Championships”. Feedback on “Sixth place for both Irvine and Ryan overnight at World Championships”.